Audrey Epstein joined The Trispective Group as a founding partner ten years ago, following a 20-year corporate HR career focused on her passion: driving executive, team and organizational excellence. Prior to her consulting experience, Audrey managed learning and development functions within large companies and non-profits. She enjoyed partnering with all levels of leaders, from front line supervisors to top executives. She designed and delivered leadership programs and team sessions for employees throughout the U.S, Europe, and in Asia. Additionally, she built state-of- the-art leadership programs for executives, high potential groups, and special populations such as executive women. She also specialized in developing programs to drive better bench-strength in organizations. 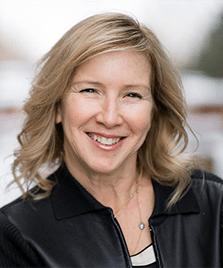 Since becoming a partner at Trispective, Audrey has successfully coached executives in dozens of different organizations, facilitated team sessions for many executive teams, and developed and led leadership programs for hundreds of leaders. She has also partnered with numerous HR executives, helping them to increase their coaching, business partnering, and facilitation skills. Audrey has an approachable but no-nonsense style, which enables her to help executives quickly assess their key strengths and challenges and identify practical and achievable actions to sustain high performance. She is as comfortable working with large, diverse groups as she is one-on-one with top executives and key leaders. Audrey’s clients often tell her that they value her honesty, her ability to simplify complex situations into clear steps and her useful advice and suggestions. Audrey truly cares about her clients’ success. Audrey is certified in many assessments and instruments including MBTI, Hogan Assessments, Insights, DiSC, Lominger, EQ-i, as well as multiple other 360 tools. Audrey is a graduate of Tufts University. She lives in Denver with her husband and three sons. She enjoys spending her free time outdoors in Colorado, reading everything she can get her hands on, and traveling the world with her family.